CenterStage in Lake Forest Oscar Night party! Want to bet on your favorites, and make a little extra cash for CenterStage? Cast your ballot for our 50/50 Oscar Night sweepstakes! To take part in the balloting, and bring home a winner’s jackpot, all while contributing to CenterStage in Lake Forest, register to play at the Oscar Night Party for just $10.00 per ballot. The winner takes home 50% of the pot – with the other 50% going to CenterStage in Lake Forest! Click here to download your ballot! Join us on Sunday, February 24, for our SECOND ANNUAL Academy Awards-Viewing Party, at Post Time Sports Bar & Grille, 13860 Rockland Road (Rt. 176) in Green Oaks. Just past Rondout, on the way to Libertyville…. and slightly to the east and across Route 176 from the entrance to Lambs Farm. Scroll down for the Google map for the exact location. Event Time: From 6:30 PM…? 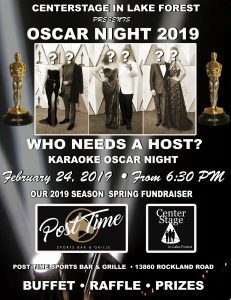 Previous Post:It’s Our 2nd Annual Spring Fundraiser…Oscar Night 2019!